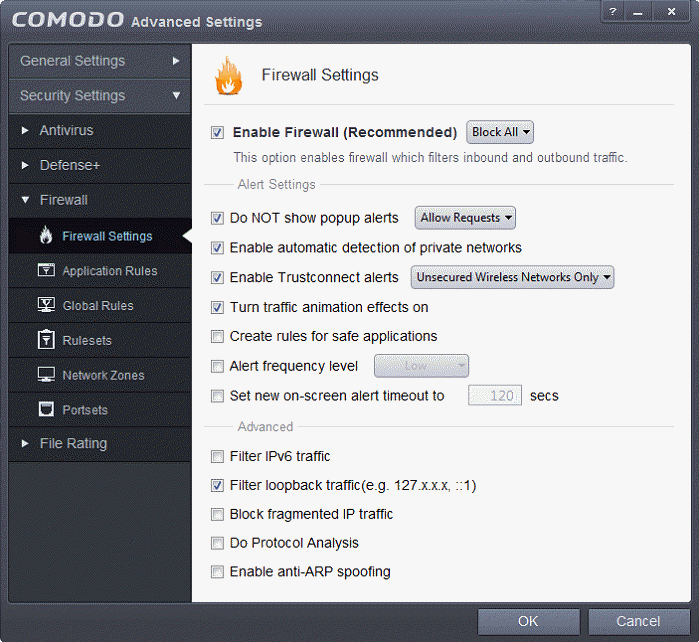 The Firewall Settings area allows you to configure the security of your computer and the frequency of alerts that are generated. The Application Rules area allows users to view, manage and define the network and Internet access rights of applications on your system. The Global Rules area allows users view, manage and define overall network policy that applies to your computer and is independent of application rules. Both application rules and global rules are consulted when the firewall is determining whether or not to allow or block a connection attempt. For Outgoing connection attempts, the application rules are consulted first and then the global rules. For Incoming connection attempts, the global rules are consulted first and then application specific rules. The Rulesets area contains a list of preset network control rules that can be re-used and applied to multiple applications. For example, there is a 'Browser' rule, an 'Email Client' rule and rules for 'Trusted' and 'Blocked' applications. The Network Zones area allows you to group IP addresses and ranges into named zones. Once defined, privileges and rules can be applied to these zones in other areas of CIS. For example, global and application rules can be applied to network zones. This interface also allows you to block network zones. The Portsets area contains groups of important / regularly used port numbers that can be easily selected as part of a global or application rule.